Hall of the Mountain King: Review: Pharaoh, "Bury the Light"
There are some bands out there that really don’t need a review. When you hear the name, you know it’s going to be quality. Pharaoh has become one of those over the years. But, since it’s my job here, I’m going to give you a review anyway. Pharaoh is dependable. So much so that I wanted to say that they do on Bury the Light pretty much what they’ve done since they released 2003’s After the Fire, but I went back and took a listen to that record in preparing to review this one. What I realized was the band’s sound has evolved quite a bit since those days, but it’s been in a gradual way. 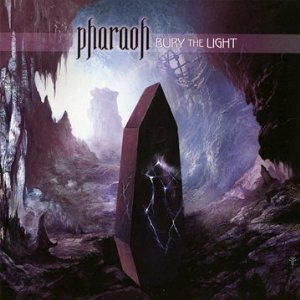 So if you’re familiar with Pharaoh, no, you won’t be surprised by anything you hear on Bury the Light. But there are nuances. First track “Leave Me Here to Dream” is one of the most obvious as a full-on prog rocker. Bassist Chris Kerns gets a little bit of a spotlight in the early going, and the slightly angular riffing of Matt Johnsen is interesting. There’s also a nice prog jam section toward the middle of the song. As always, Johnsen’s licks are impressive without being overbearing. He’s the rare great talent that delivers what the song needs rather than stepping outside of it to try to show you everything he can do on the fretboard. But it’s not just the shredding arena where Johnsen’s strengths show. There are some very cool clean guitar pieces scattered around. There’s a nice brief one at the beginning of “In Your Hands” before it becomes a more prototypical power metal number. But my favorite is the dark interlude early in “Castles in the Sky.” The song itself is kind of a NWOBHM number, but that little run is awesome and reminds me a bit of a Jeff Waters Annihilator piece. Vocalist Tim Aymar is as much a strength of Pharaoh as Johnsen. He can hit all the power metal notes, but there’s an aggressiveness in his voice that many singers in the style don’t have. It comes out on thrashier numbers like “The Wolves.” He hits those highs, as on the chorus of “Graveyard of Empires,” but he’s not afraid to turn in a softer, more emotional performance, either, which he does well on “The Year of the Blizzard.” That song is interesting, as well, in the inspiration it takes from The Who. There are some choppy Pete Townshend-inspired 1970s classic rock licks that lead into the heavier portion of the song, then later there’s another one of those cool clean guitar parts that leads into a build-up very reminiscent of the classic band. That, of course, brings me to probably my favorite song on the record, “The Spider’s Thread.” It opens with another one of those nuances, some clean, very jazzy sounding guitar chords, then a very heavy riff attacks over them. There’s some power, some thrash and some prog in the tune, and those opening chords do make another appearance. Like most of the songs on this album, it doesn’t go for the easy hooks either musically or vocally, yet it remains quite hummable and memorable. There are, of course, a few songs on Bury the Light that do stick pretty closely to that early sound of the band, particularly late in the record. “Burn With Me” and the darker “Cry” fit the bill. If you’re familiar with Pharaoh, you know, pretty much what you’re going to get, and you know that it’s going to be quality. If you’re not familiar with Pharaoh, what the hell’s wrong with you? It’s time to discover them, and Bury the Light is as good a place as any to start. Visit Teeth of the Divine for a chance to win a free copy of Bury the Light.